I’m a little ashamed to say that I never met Tony Bourdain, although I heard about him long ago from a friend of mine who used to work as an editor at this magazine. This was before I’d begun writing about what was, back then, the mannered and cosseted world of big-city restaurants. My editor friend said he’d heard about this chef at Les Halles with a vague literary talent, and had commissioned him, in a random way, not hoping for very much, to write something about life in the kitchen. The chef was somebody he hadn’t heard much about, which wasn’t necessarily a surprise, back in the late-’90s superstar-chef era, when most discussions about restaurants were framed around the magical qualities of the same four or five first-name chefs — Mario, Daniel, Jean-Georges — again and again. When the piece came in, my editor friend took the little manuscript — which blew apart this carefully cultivated superstar-chef image, and lifted the curtain on a hidden, hilarious, helter-skelter, Darwinian world that unfolded in kitchens around the city night after night — to his editors, who liked it so much, they even commissioned a photo shoot of young Tony Bourdain, posing with his knives and his thumb ring, in a backroom restaurant kitchen somewhere downtown. To his eternal regret, however, my editor friend (and his editors) were fired shortly after the photo shoot, and the next time he saw the story, it was running not in his former magazine, but in The New Yorker. 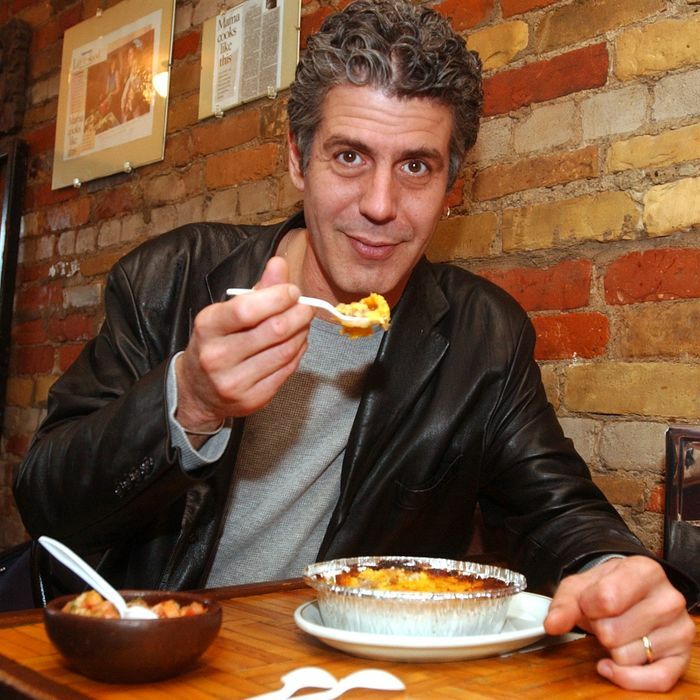 On the basis of that piece, as history knows, Bourdain went on to publish his great Catcher in the Rye text, Kitchen Confidential: Adventures in the Culinary Underbelly, a book that almost instantly turned Tony Bourdain into the Pied Piper of the kitchen-slave revolution, a movement that was gaining steam at the time, and would go on to change dining forever. The last decade and half has seen the backroom culture of the kitchen — the tattoos, the love of offal and after-hours bowls of ramen, the drugs, the bullying, the bro culture we’d all realize too late was tragic instead of heroic — move front and center, first into trendy dining rooms, and then into the world at large. Before this, the realm of famous restaurants was small, idiosyncratic, and stuffy, largely populated by eccentric know-it-alls. But the public soon began to learn about the grimy realities lurking underneath the luxurious veneer. “Dining” was demystified, opening it up to the evolving tastes of a new, savvier Starbucks generation. Chefs were all too happy to oblige, opening restaurants that were more immediately accessible, and more fun, than any place these diners’ parents ever went. I would argue that no one person was more responsible for this strange awakening than Bourdain, particularly here in New York. He was a world-weary traveler, of course, but he was also a New Yorker to his core. He learned to eat here, and he learned to write here, and the particular POV that he defined and fomented — filled with accessible, umami-rich cooks’ cooking — took hold in the city at restaurants like Les Halles (when Bourdain cooked there), Keith McNally’s Minetta Tavern, and David Chang’s restaurants. I’ve compared this sensibility before to a kind of distinctive sound, which you could hear building as you made the gastronomic rounds, especially downtown, from Mario Batali’s restaurants, where the rock ballads blasted overhead as Babbo diners ate liver-stuffed ravioli, to the noisily boisterous rock-club intimacy of venues like Gabrielle Hamilton’s great bistro Prune. Even without a real restaurant of his own, Bourdain did the most to popularize this particular sound for the masses. I would also argue that with Bourdain’s death, the great kitchen-slave revolution of the early 21st century is at an end. Many of the old revolutionaries, like Chang and Tom Colicchio, are stout mainstream citizens now, and many of the ideas that they espoused — open kitchens, pork haunches on every menu, less pretension in the dining room, slow food ingredients, social and political responsibility among those who prepare your food — have become part of the mainstream as well. Like all revolutions, this one also contained the seeds of its own destruction, specifically the seamy, abusive, misogynistic side of the kitchen bro culture, which Bourdain, toward the end of his life, felt so guilty about, and responsible for. Early on, Bourdain saw the newly democratic revolution brewing, not just in the dining world, but everywhere, and more than many of his colleagues, used his influence to spread the word the best he could. He got out in front of it, and went on to become its de facto leader. In a life defined by professional success and influence, it might be the most lasting achievement of all.